We know that iPhone, iPad or iPod touch are all comes with a prominent built-in camera functions and people like to use it to take photos to record all excellent moments in the daily life. So in most situations, people have saved lots of pictures on their iDevice and wish to find a way to backup, or share these photos on other disks like desktop PC, MacBook, etc. Due to the Apple's security limitation, people always feel impossible to transfer photos between different devices or disks, but actually, you can do it with the help from some easy-to-use 3rd-party program. In this article, we'll outline the best photo transfer apps for iPhone, iPad and iPod touch users. You can go through them and pick up the best one at your will. MobiKin Assistant for iOS Free (Windows/Mac) is a freeware from MobiKin studio, that allows users to copy photos from all generations of iPhone, iPad and iPod touch to Windows or Mac computer with one simple click. And you're also allowed to copy other files like movies, TV shows, contacts, text messages, etc. between iPhone, iPad, iPod and desktop computer freely. With the intuitive interface, you can handle this program ASAP. And there is no virus, spyware and adware during the whole process. 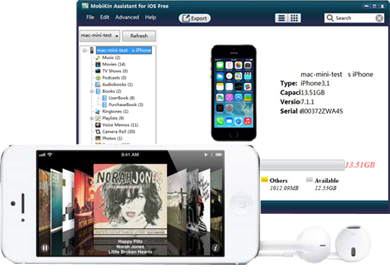 What's more, the program will not occupy your iPhone storage space due to it is a desktop application. Cool, right? If you wish to know the detailed tutorial about the program, you can go to here. With over 2 million downloads, Simple Transfer could be one of the best iPad, iPhone photos transfer application in the iTunes store. It is very easy to copy all photos from iPad and iPhone to the computer and it'll help users to preserve the photo's Meta data in the process. What's more, all your photo albums on the computer can easily be transferred to your iPad, iPhone or iPod touch via Wi-Fi without restrictions. And there is a high protection mode that allows users to set up a favorite password to access the photos as you like. The program can works on all kinds of operating systems on the market. Photo Transfer App, from the name suggestion, it is mostly used to transfer a data like photos, videos between iPads, iPhones and Mac pros over Wi-Fi aid. It can easily transfer photos from your iPhones to computers and even vice versa. This application can save the photo's metadata and transfer videos between iDevice and PC as well as photos. This app is not a free software on the Internet, so if you like it, you may need to purchase it from the iTunes store with your Apple ID & password. Dropbox is an app that offers a good cloud based service for users, and it enables you to take various photos from anywhere and share them in an easier mode. Once you transfer photos from iPad or iPhone to Dropbox, you can easily view them on the computer, web and other devices. It also offers you a 2 GB free on cloud space. However, for any additional advantageous features, you may need to pay for it. If you also like some category of photos, you can add them to your Favorites, you can then preview them offline. This is a photo transfer app that can be used to transfer your photos from any devices like iPad, iPhone, etc. You can select and transfer multiple photos at once. Metadata is also retained in mass-download mode, and it has an Optional password protection to the web interface. This program can satisfy almost all your photo transferring needs in the daily life and work. Furthermore, the application provide users with a back up service, but it will cost you about $2.99.